The first time the Western world became familiar or in touch with the crime entangled Russian business scene was when American businessman Paul Tatum was murdered by unknown assailants reputedly over a business dispute. The murder sent shockwaves through the business community and had American congressmen screaming for justice after a few months it seemed like all was forgotten, Tatum as well as the corrupt Russian business scene. Maybe forgotten but hardly out of mind. Paul Tatum was born in 1955 in Edmond, Oklahoma. He graduated from Edmond Memorial High School. In High School Tatum already showed an enormous drive to succeed and it became clear to his fellow students and his teachers that Tatum would excel at whatever he pursued. After dropping out of college Tatum began hopping from one business deal to another doing whatever, he eventually ended up doing fundraisers for the Republican Party. Tatum first came to Russia in 1985 at the age of 29 when he was with an American trade delegation. Tatum immediately saw the potential of the Russian market and began planning his path to Russian success. In 1987 after 2 years of planning and preperation Tatum was ready to conquer Russian business, Tatum set up a business center for foreign firms in Moscow a first for the communist city. Not long after he and several other American businessmen founded Americom International Corporation. Two important associates in Americom were H.R. "Bob" Haldeman and Bernie Rome two former members of President Nixon's chief of Staff, Tatum came into contact with them while he was working as a fundraiser for the Republican Party. These 2 men helped Tatum get an 'in' with all the important people in Russia and enabled him to set up and expand his business without too much dificulties. By 1990 Tatum's big break came. The break came when Tatum's company RedAmer Partnership joined up with Radisson Hotel Corporation and signed a contract with Goskom Intourist and later the Moscow City Government that agreed to construct an American hotel combined with a business center that would go by the name Intourist Redamer Hotel and Business Center (later changed to Radisson - Slavyanskaya Hotel). A year later in the June of 1991 the Hotel opened it's doors. At the numerous parties at the hotel and business center Tatum mingled with powerful figures from Russian business, politics and eventually ,and inevitably, the Russian underworld. The Moscow Underworld is a maze filled with a different Organized Crime group or gang on every corner. In the mid 1990s the Russian interior ministry did research on the amount of gangs in Moscow and came up with around 200 organizations, about 20 of those had branched out to other parts of the world. The Moscow underworld is made up `out` of groups from several different ethnic backgrounds. The main groups are Slavic (Russian), Georgian, Armenian and Chechen. With so many groups in Moscow Moscow business is inevitably tangled up with Organized Crime and vice versa. Organized Crime is said to control around 75% of all private businesses in Russia. With Russian criminals threatening legit business and demanding pay offs and ineffective Russian law enforcement it is not surprising then that the demand for private security sky rocketed seeing to it that across Russia private security businesses stepped into the forground. In 7 years 25.000 Russian security firms were established employing between half a million to a million workers. These workers are mainly ex Spetznaz commando's or war veterans who are desperately seeking money and would rather stay legit then go into crime. The funny and dangerous thing about these security firms is however that most of them are controlled by Organized Crime groups. With this concrete basis Organized Crime has a lockdown on the entire legit business world in Russia. It was this shady world that Paul Tatum was slowly becoming part of. Tatum's Hotel was doing good business and things went great, a little inconvienant for business was the August 1991 Russian Coup but after the frenzy died down Tatum emerged even more powerful. It is rumored that he was the one responsible for a direct phoneline between the White House and Gorbachov's camp. After the coup things settled down again and Tatum went back to business. A business that was ever changing. In 1992 Goskom Intourist was liquidated and the Moscow City Government became a new partner in the deal. No big deal for Tatum at first, his company still owned 80% of the 50% (50% that belonged to the American partners in the deal, the other 50% belonged to the Russian companies and Moscow City Government) of the property. But with the Moscow City Government came a partner that held a lot of power, more than any of the other partners in the deal. The Moscow City Government had connections throughout the Russian government and it's system, it could pressure anyone to give in to their demands and their demands would become clear very fast. Paul Tatum and The Moscow City Government had a quiet working relationship for about 2 years after that it started to rumble. In January of 1995 problems arose with the General Director of the American Partnership. The American hadn't received his Russian visa and wasn't going to receive one either. The loss of the General Director was a big blow for Tatum because now that position would be taken over by someone from the Russian partnership. Umar Dzhabrailov was named General Director. 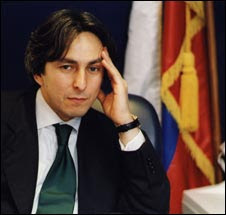 Dzhabrailov was a Chechen who had heavy connections within the Moscow City Government and used those connections to get into the position of General Director. But those weren't the only connections Umar Dzhabrailov had, several law enforcement agencies including the F.B.I. and Interpol list Dzhabrailov as a member of Chechen Organized Crime. A report in the Russian press went even further calling Dzhabrailov a "known contract killer and one of a handful of Chechen mafia bosses operating in Moscow." Dzhabrailov doesn't deny his ties to Organized Crime but says they are "only social". With Dzhabrailov as General Director things made a turn for the worse for Paul Tatum. Paul Tatum didn't realize it that fast but the Russian partnership had made ousting him it`s priority....by any means possible. While Tatum went about his business the Russian side showed it's teeth. On St Valentine's Day 1995 one of Tatum's bodyguards was found beaten and stabbed in the chest with a pen knife. The bodyguard also had a message from his attackers: "Tell Paul it's high time he left for home." Most businessmen would've gotten the message and would've left town immediately, but not Paul Tatum. Tatum had grown a fondness for the Moscow nightlife, the clubs, the women. Tatum had enough money and liked to spend it and some even say he started acting like a mobster throwing around cash and surrounding himself with gorgeous women. Meanwhile the cold war for control of the Hotel and business center continued. Tatum had upped his bodyguards and after the attack on his bodyguard took extra security measures he now always had his bodyguards guard empty rooms so no one could plant bombs in them. He also decided to fight Dzhabrailov in the media he called him a "genuine Mafioso" who "has threatened he can kill me at any time" The fight had turned ugly and was now spilling from the boardrooms onto the public scene. "Yuri M. Luzhkov: I must tell you that not one person here in Russia or abroad is fooled. All know of the dangerous activities. I implore you to show the world your resolve and commitment to become the catalyst to solve these grave problems-peacefully, efficiently, with fairness and justice for the investor and for the legal agreements under which their original activities were created. The world now awaits this signal. This is your choice and your crossroads. Where do you stand, Yuri M. Luzhkov? In the shadows or the bright sunlight?" It would be Tatum's last defiant gesture. On November 3rd, 1996 around 5.00 PM Paul Tatum left his Hotel and headed towards the Kievskaya metro station, where he had arranged to meet someone. When Tatum arrived there with his bodyguards the person he was supposed to meet wasn't there, instead a man walked up towards Tatum and shot him 11 times from 5 meters distance with an AK-47. Tatum's bodyguards did nothing to protect there boss, the killer dropped his weapon and fled the scene unharmed. Tatum's bodyguards rushed their wounded boss to the hospital but to no avail Paul Tatum died shortly after his arrival. 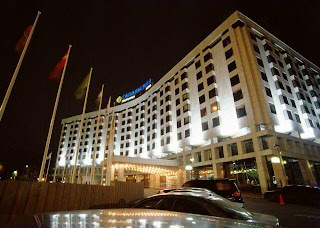 Shortly after the news of Tatum's death Dzahrailov and the Moscow City Government took undisputed control of the Radisson Slavyanskaya Hotel and businesscenter. He denied any role in the Tatum murder but did say: "What goes around, comes around". Dzahrailov also saw to it that a planned memorial service at the hotel was nixed as well as Tatum's wishes to be buried at the prestigious Novodevichy Cemetery. 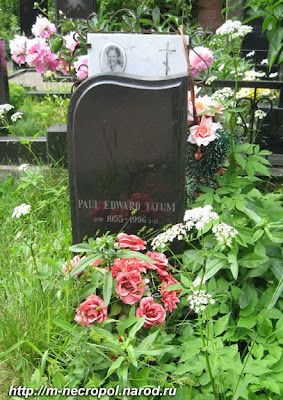 Tatum was eventually cremated and interred in the Moscow Novodevitsji cemetary. "Paul never learned it was their country," said Tatum's Americom associate Bernie Rome. "He was like a bull in a china shop. He didn't understand you have to play by Russian rules. It's all very sad." Tatum's murder shows how corrupt Russian business had become. Russian business is controlled by Organized Crime groups and powerfull businessmen who use strong arm tactics and criminal ways to get deals done. With Russian law enforcement and the Russian courts inefective Russian business has absorbed Mafia tactics to get it's demands done. It will be interesting to see how and if Russian business will ever de-criminalize and return to normal business procedures such as sueing each other over a business dispute instead of putting out a murder contract. It is interesting that the relatives not take the body to the United States, and Paul was interred in Kuntsevo Cemetery, Moscow. On the monument orthodox cross but I think that Paul was a catholic, because it american.Orthodox cross here possibly mean that he was buried in ortodox country with ortodox traditions.